Daylighting is a system that facilitates the entry of natural light to provide internal lighting through the use of windows or other openings that admit light. With this system in Atlanta roofing that harvests daylight, energy savings are realized through reduced use of artificial energy. The most common method that allows daylight to penetrate buildings is through windows. The vertical design and various orientations of windows admit and diffuse daylight at different times of the day. Depending on the local climate, several windows with different orientations may be made to create the right combination. Skylights are openings found on roofs that admit sunlight into inner spaces of the building or house. Most residential and commercial buildings today incorporate skylights because they are the most efficient method in admitting daylight on a per unit area basis. The glazing options vary depending on the needs of the building but are mostly made of glass or plastic. A variation of skylight is the roof lantern that sits atop the roof instead of being embedded in the roof like a skylight. A clerestory is a high portion of the wall with windows to admit light, air or both. The design is found mostly in tall structures such as basilicas and churches although modern transportation has adopted the architectural design to accommodate lighting and ventilation. Clerestory windows are high vertical windows that maximizes daylight, especially when they are built facing the equator. A light tube is a device placed on the roof that admits light into its interior and eventually distributes it inside the house. Unlike a skylight, light tubes do not transfer as much heat because of their smaller surface area. It consists of three parts—the light collector on the roof made of transparent materials, the tube with reflective coating and a diffuser assembly inside the house that distributes daylight into interior spaces. 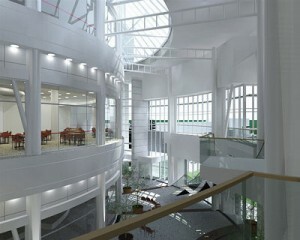 Atrium is a large open area within buildings where daylight penetrates through glass roof or wall. Light penetrates into the working areas inside the building, the degree of which depends on their location. The upper storeys receive the greatest amount of daylight while the lower storeys must depend on reflected daylight from surfaces such as reflective floors.